Desire tells a very human story. It bends and shapes our lives. In big and little ways. If discipline tells us how to do something well, desire insistently tells us why. And if that desire shapes your profession, it requires courage and a profound willingness to fail. There is endless work no one sees and profound fears never expressed. The food world is littered with sidetracked dreams and that persistent “almost” that doesn’t go away. In 2019, I want to celebrate those people who wade into that fray to make this world more delicious. Local people with local dreams. I like to think that the space where discipline and desire join forces is craft. And, in rare instances, art. It is inspirational to take stock of all the people in our community forging a life with those dreams. The brewers and distillers, the cheese-makers and farmers, the chocolatiers and bakers and beekeepers. I want to help tell their story. Because each time we take a bite or a sip, their story becomes a part of us. Acme’s Meet the Makers Dinner Series. The 2019 edition. We are going to kick it off with a dinner celebrating Chapel Hill Creamery on Wednesday, January 16th. In 2000, Portia McKnight and Flo Hawley bought a farm right here in Orange County and nine Jersey cows. And then, well, they got to do the intensely hard work of running the farm and making and selling their artisan cheese. 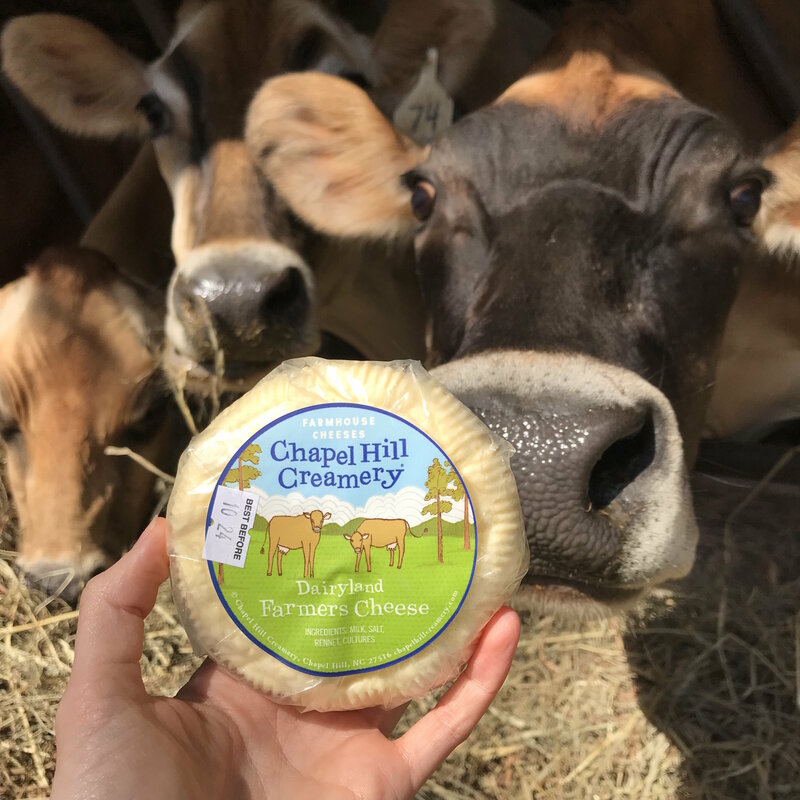 Today, the creamery has 30 cows and a small, dedicated crew committed to making the best farmstead cheeses in the state seven days a week. At Acme, we are proud to use their cheese. And proud to call them friends. The dinner will start at 6:30. It will be a four-course meal highlighting four different artisan cheeses mixed with some serious Acme love. Tickets for the dinner are $48. Seating is limited and reservations are required in advance and can only be made by calling the restaurant (919 929 2263). You’ll get to have dinner with the people that make our lives delicious – people who milk the cows at 5am and the people who work on the farm and all the people in between who make it possible for us to have such wonderful cheese 365 days a year. You’ll taste their passion for what they do and for where they live. So, that’s where we’ll begin. Our delicious story starts here. This weekend @ Acme: smoked tuna carpaccio. Acme cornbread. Pan-seared mahi-mahi. Lobster pot pie. Old school mushroom pie. Bourbon glazed market carrots and beets. 22oz bone-in ribeyes. Pecan-crusted fried chicken. Housemade gnocchi. Gumbo. Stiff drinks. Brussels sprouts. Steamed clams. Herb & garlic angel biscuits. Coconut cake with pineapple sherbet. Pan-seared duck. Watercress salad. The BEST sparkling red wine ever. Blackened salmon. Calamari. Cheeseburgers. Well, that’s all the news from Carrboro, The staff at Acme look forward to serving you soon.